PRODUCT DESCRIPTION: A granular material which can last over a month outside. It is designed to stop animals from leaving their droppings around your home. It has a slight odor when in it's container but when applied is not detectable by people. It will withstand most weather including rain but the use of the Granule Guards will lengthen its effective residual. 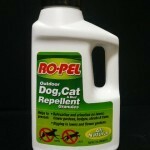 Great for nuisance dogs and cats but can be used for just about any animal. This is because Ropel works two ways. First, it absorbs and neutralizes existing odors so animals are not readily attracted to these same "marking" or "scenting" spots quite as much. Furthermore, the odor of Ropel is one which dogs, cats and other animals don't really like so they tend to ignore where the granules are present. WHERE TO USE IT: Outside, around the home and in flower beds. RATE OF APPLICATION: 1 lb will treat 100 sq/ft. If using Granule Guards, place 8 ounces in a Guard and place them every 10-15 feet, depending on the area being treated and the coverage needed. 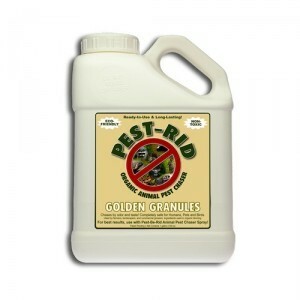 RATE OF APPLICATION: 1 lb treats 250 sq/ft; renew treatment every 30-45 days. Could the Ropel granules be used in a kennel (on cement) in the garage? I have a young lab that persists in urinating/defecating in the inside kennel even though she and our older lab have dog door access to go outside to an outdoor kennel. The older lab figured this out right away, but this young one does her business both inside and outside. A second problem is she will also defecate in the raised bed the two labs share (I keep old blankets in it.) Not every day but fairly often. I have no idea how to stop this behavior. Thanks for any help. 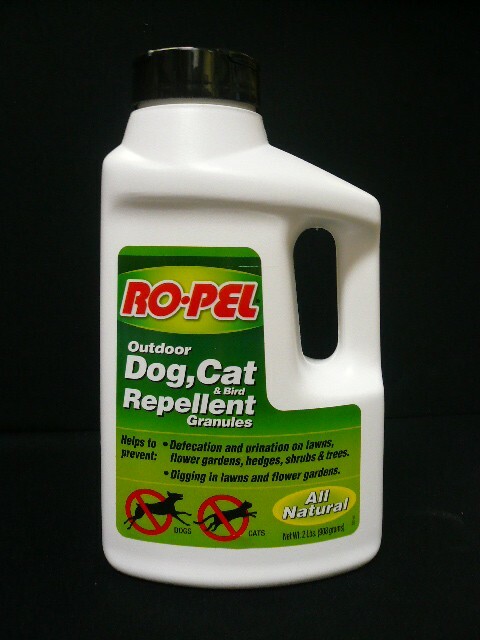 Ropel is designed to "repel" animals from specific areas. But it will only work on animals that don't "reside" on the property being treated. And in our experience, it tends to work best on adult dogs – not young ones. So with that being said, I do not believe this would be a viable option for your problem. But here's what I have done in the past to get over this hump with kennel kept dogs with similar issues. First, labs are smart and there is no reason the young one won't learn the right behavior. But if there is a urine/feces scent in their bedding or inside kennel areas, the young lab will no doubt believe its "okay" to use these areas. So the first thing you should do is neutralize the old scent. This can be done by applying NNZ to the cement and bedding. NNZ won't be hazardous to any of the pets but it will immediately diffuse the odor. And by diffusing the odor, the young lab will in turn look for areas where it's "acceptable" to go and over time, learn it should be done in the outside areas. Now initially you should treat the entire inside area and bed. But after the initial treatment, you should only spray where followup accidents happen. Now at the same time you should use negative reinforcement to complete the training. Having trained many kennel dogs (Brittany spaniels, german shorthairs and beagles to name a few), I have learned a can of compressed air is handy for this job. A 1-2 second blast of air directed at the labs face while holding him close to the accident spot will teach him to not use that location again. And after a few shots of the air for any inside kennel or bedding mistakes, he/she should learn to take their business outside where the odor of feces and urine will be omnipresent and where no blasts of air will follow their use of the area. In the end, the combination of "no odor" and negative reinforcement will do the trick within a week or two. Hi, My neighbor's dogs keep pooping in front of my garage door (on cement). My kids stepped on it every morning. What product do you recommend to keep her dogs away (products that won't hurt the dogs)? There are two things you need to do. First, its important to understand that this behavior is predicated and controlled by the existing smell now established. Dirt and cement will readily absorb feces and urine odor and the more concentrated it becomes, the more likely it will attract dogs to use the location over and over which is now happening. Basically the odor has become impregnated into the ground and this smell tells the dogs this is "their" area to use (aka: their bathroom). With that being said, it should become clear that to stop the behavior you need to eliminate the odor. This can be done by applying NNz to the cement and surrounding ground. NNz will diffuse the smell immediately. This in turn will cause the dogs to loose their focus on the spot and begin to consider an alternate location. You'll need to do at least two applications of the NNz and expect to apply 1-2 gallons of mixed solution per treatment. Next, you will need an extra bit of "motivation" to keep them away. So after treating the ground with the NNz, install a Yard Gard Ultra Sound device. This unit emits an ultra sound frequency that will alert stray dogs to "stay away". In doing so, the Yard Gard will effectively keep them off your property. Now you need to run the Yard Gard on its "constantly on" 24 hour mode. For this setting, you'll need to power it with the included AC converter power option. In other words, you will need a power outlet close by to keep the unit constantly on as this is the required power setting for your application need as it will not work if configured to run via the battery option. Run the unit for 2-4 weeks, around the clock, and make sure you have it positioned to "blanket" the area they're using so they can't enter the space without hearing the sound. As for safety concerns; neither product will affect people or pets. The NNz is safe for use inside and outside the home and won't harm pets, plants or people. As for the ultra sound device; the sound waves are harmless to people and though dogs don't like the sound, they aren't adversely affected by it. They hear it, note there is something "stressful" in the area and move away. Lastly, the Ropel Granules won't work in this scenario and are only designed for use on outside property edges away from the home or structure. Once dogs are using areas adjacent to a building, you need to diffuse the smell and establish a sound barrier to achieve the desired results.